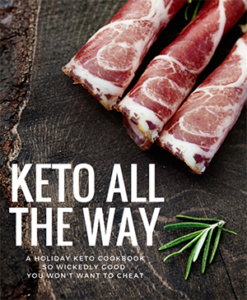 Another restaurant quality, low-carb dish that’s easy to make at home! 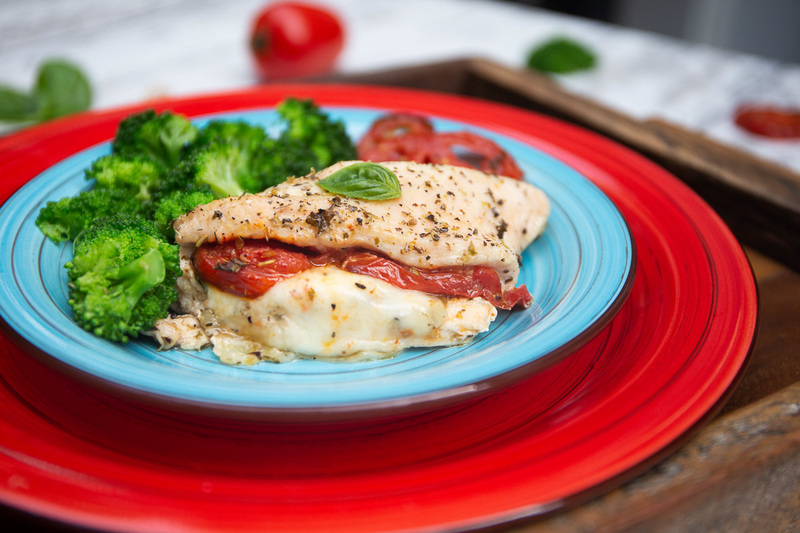 The trick to this Italian Marinated Baked Chicken Caprese recipe is to give the tomatoes a quick jaunt in the oven to caramelize a bit before you stuff them into the chicken. This cooks off the tomatoes extra moisture, leaving flavor-packed morsels. Variation Tip: If you don’t have time to roast the tomatoes, you can use roasted red peppers (from a jar or pre-made) inside the chicken instead. You can also use chicken thighs instead of breasts. Preheat the oven to 450 degrees F. Line a baking sheet with aluminum foil and grease it with oil. 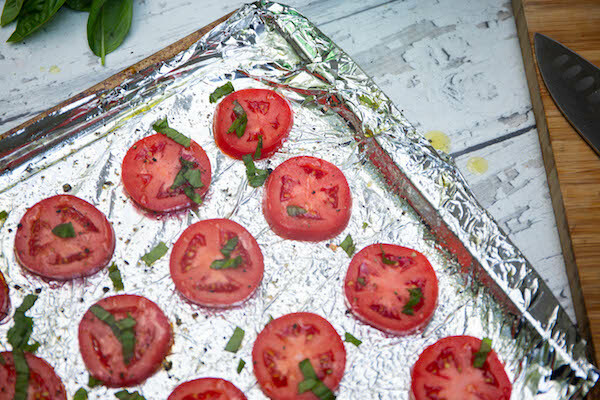 Slice the plum tomatoes into ¼ inch thick slices and place them flat on the prepared baking sheet in a single layer, no overlapping. Drizzle 1 tablespoon of olive oil over the top, then sprinkle with garlic salt and pepper. Chop about 5 basil leaves and sprinkle those over the top of the tomatoes as well. Bake for 20 minutes then remove from the oven and let cool. Pound the chicken breasts to about a 1-inch thickness, and then cut a horizontal slit into each to form a pocket. Use a fork to lift the tomatoes and lay them on top of the mozzarella. Drizzle the remaining 2 tablespoons of oil over the breasts then sprinkle the Mediterranean spice blend, a decent dose of garlic salt, ground pepper, and Italian seasoning over the breasts. 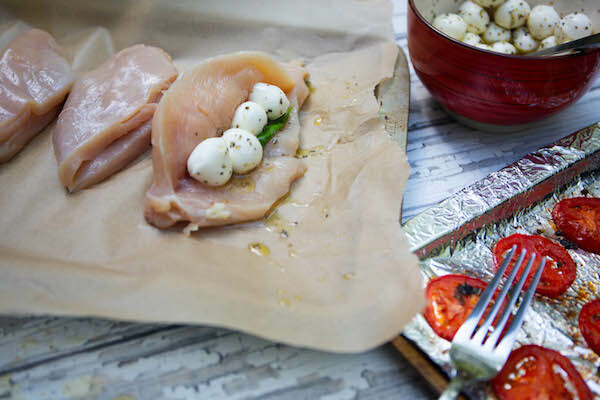 Place the stuffed chicken breasts in a glass baking dish, or on a baking sheet lined with parchment paper. 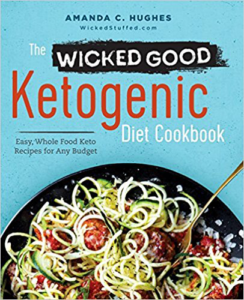 Bake uncovered ar 350 degrees F for 40 minutes or until the internal temperature reaches 180 degrees F. Serve right away with your favorite keto-friendly vegetables. 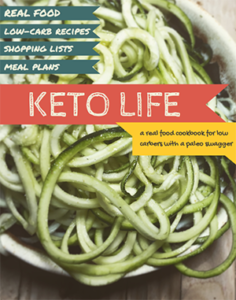 Another restaurant quality, low-carb dish that’s easy to make at home! 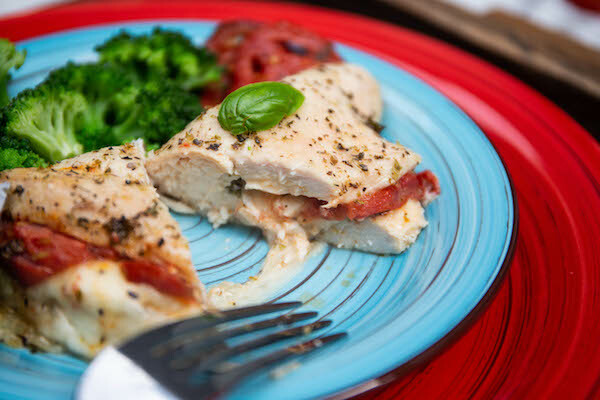 Place the remaining fresh basil leaves inside the butterflied breasts, then top each breast with 4 mozzarella balls. The trick to this Italian Marinated Baked Chicken Caprese recipe is to give the tomatoes a quick jaunt in the oven to caramelize a bit before you stuff them into the chicken. This cooks off the tomatoes extra moisture, leaving flavor-packed morsels. Loving these Italian flavors? Try my Rhode Island Red Marinara Sauce next!